Suffolk’s Special Constabulary has today, Wednesday 23 January, launched a new video in the hope of inspiring more dedicated volunteers to join the force. The constabulary is seeking committed individuals who are keen to work in the heart of their communities supporting regular officers in tackling local policing issues. 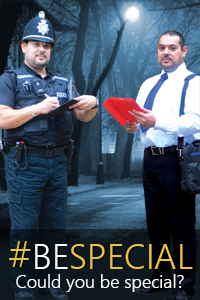 The video, which uses the hashtag #BeSpecial, features Special Constable Scott Waring, carrying out his duties. Scott, who also works as a ticket inspector for London Underground Limited, has been with Suffolk’s Special Constabulary since 2012. He currently volunteers within the roads policing team. The county has around 150 Special Constables who volunteer their time to assist. In 2018 for example, Suffolk’s specials completed over 5,400 duties, totalling 35,150 hours of policing – this is the equivalent to 18 full time officers helping to keep Suffolk safe alongside the force’s regular officers. Karen Harris, Specials, Volunteers and Cadets, Manager, said: "All of our special officers are highly trained and play an essential role in preventing, reducing and tackling crime and keeping Suffolk safe. “By becoming a Special Constable, individuals have a positive opportunity to develop their existing skills and to learn new ones. They will also have the opportunity to increase their confidence and improve their CV. Suffolk’s Police and Crime Commissioner, Tim Passmore said, "I am a great supporter of the fantastic work that our specials carry out across the county every day and I’d like to encourage anyone who is interested to come along to one of the information events and find out more. He added: “Specials are an integral part of the policing family. They are extremely valued and valuable, and play an essential role in preventing, reducing and tackling crime to help keep Suffolk safe. Saturday 26 January – 10am-1pm – Rifle Hall, London Road, Halesworth. Monday 11 February – 6.30pm – Suffolk Constabulary Headquarters, Portal Avenue, Martlesham Heath. Saturday 23 February – 10am-1pm – Southgate Community Centre, Caie Walk, Bury St Edmunds. Saturday 16 March – 10am – 1pm – King Georges Community Centre, King Georges Avenue, Leiston. Saturday 27 April – 10am – 1pm – Haverhill Arts Centre, High Street, Haverhill. Follow @SuffolkSpecials and @SPVolunteers on Twitter.